The Mermaid's Tale: Life on Mars: Why microbes? Life on Mars: Why microbes? When the proponents of costly explorations of Mars start justifying these projects, they usually reduce the reason to the objective of finding life there. That's good space-travel-as-Disney imagery that will get the public to open up their wallets. In fact, even the most hyperbolic NASA proponents don't promise 'advanced' life like humans (or, even, little green men) there. No, they are always referring to microbes, so tiny that we can't see them from telescopes or cameras aloft in orbiting spacecraft. We have to land, and indeed we have to land guys with shovels to find it. The argument that Mars life must be primitive is based on the geological history of Mars which suggests that it and the Earth originated at similar times, but about 4 billion years ago the smaller Mars settled down to a nearly atmosphere-free, more hostile environment unlike the hospitable environments here. But if life had begun on Mars at about the same time as it seems to have begun here, so the tale goes, it would have reached a comparable stage of primitive forms, the kind that evidence from 3.5 billion year old rocks shows was then here on Earth....life that the newly hostile Martian environment killed off. At best, if there are any surviving forms, they'll have to be hiding, protected, under the ice or huddling inside rocks. That's a pretty powerful belief in parallel histories up to that point, as if life is nearly inevitable. It seems like quite a stretch, but that's not all. Even purportedly knowledgeable scientists speak of carbon and oxygen and so on in Mars rocks, in the context of noting that these are the building blocks of life, and especially of DNA. This shows how deeply the flash-words, or 'tropes' of our time control our thinking, although we know that it's by far more likely that RNA came first (here on Earth, at least). But this is how current science is embedded in current culture. RNA has very similar molecular contents, but the implied idea is that a DNA-based protein code must be the way life works. That's how it is here, and it's the core of current life science, so it must be that way there, too! NASA will be peeking with great Curiosity everywhere it can look for anything it could claim suggests life, and eventually exploratory vehicles will try to bore down to find life, shivering modestly, in or under the Martian ice. Again, we look there because, with its unshielded solar radiation, cold temperature, and little atmosphere, Martian life can't live on the surface--or that is, earth life couldn't--and assuming the same about Martians provides a convenient escape clause for why we we haven't actually seen any Mars life. Although our current scientific culture, and its popular image, is centered on or even obsessed by Darwinian competition as the essence of life, there are many other principles that are much more pervasive and important. We described these at great length in our book MT, and in other papers. Not only do we argue that cooperation (that is, functionally successful interactions) among many contributing elements is the rule, but the same fact fits with other aspects of life. Among them are that life, from genes on up, is organized around modular functional units that interact in partially isolated or compartmentalized structures. 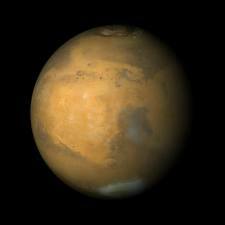 The same MT principles are even more deeply, if subtly and even implicitly, at work in surmises about Mars life. The assumption that we're looking for 'microbes' is that Martians will look like bacteria. This expectation was whetted by the idea, fostered a few years ago, that rod-like remnants of 'microbes' were found in a Mars meteorite named ALH84001, found in Antarctica in 1984. Whether this is biogenetic or biobulldroppings is beyond our expertise. But the interpretation that it was life rests to a great extent on the tacit assumption that sequestered modularized structures--cells with internal structures that sequester the inside from the outside--is a universal feature of life, wherever we may find it. The reference to DNA reflects also the assumption that life at the molecular level is a polymer phenomenon--a string of units (assumed to be nucleotides) that are grouped into local, distinct, functional parts). That means life is not just a reaction among identical molecules, even a 'cooperative' one like the formation of crystals, but is instead based on cooperative interaction. These kinds of statements about Mars life show the latent assumptions about life, not just or even not mainly about evolution but about how it must be organized. It is an implicit reflection of the kinds of principles we discussed in MT. At the same time, it reflects a lack of imagination or much thought. It is embedded in our current culture, here on Earth, where we are focused on DNA and bacteria as the primitive detectable form of life, because that's what we see here and that's the current theme of the life sciences. Could life be other than something than this? And here we mean something beyond the question of whether life must involve carbon or water, etc. Rather, we ask whether the laws of physics and chemistry mean that to be an evolvable builder of orderly but non-homogeneous complexity--forms built up with variable subunits, the way we are built of cells, organs, organ systems, and populations--must be based on spatial relationships among polymer-like molecules, whose combinatorial presence enables structures to be built. If that is the case, it is probably a rather profound truth. And yet, can that be the case? It would seem not likely, since even our understanding of life as it happened here is that it arose merely as chemical reactions in a primordial soup in some lakes, ponds or oceans. That is, it was initially some open reactions, not encased in membrane compartments, not diversified based on an array of 'instruction' molecules (RNA or proteins). If not, if there could be very different ways of what we would classify as 'life', then we could be in for some startling surprises as space is explored. And it would show how rooted human thinking is in its cultural context, no matter how objective science tries to be. How old is old, part II: 3465...and counting! Be afraid of fear, not personal genomics.